ICH Blog: So Long and Thanks for all the Hits! After a good run of two and a half years, my time with the Intangible Cultural Heritage Office is coming to an end. I started working with the Heritage Foundation in January of 2012, when I was finishing a graduate degree in public folklore and completing my final internship requirement. I loved my time here and thought I'd share with you some of my favorite projects. I started out working on a documentation project focused on baskets and basket making in Newfoundland and Labrador. 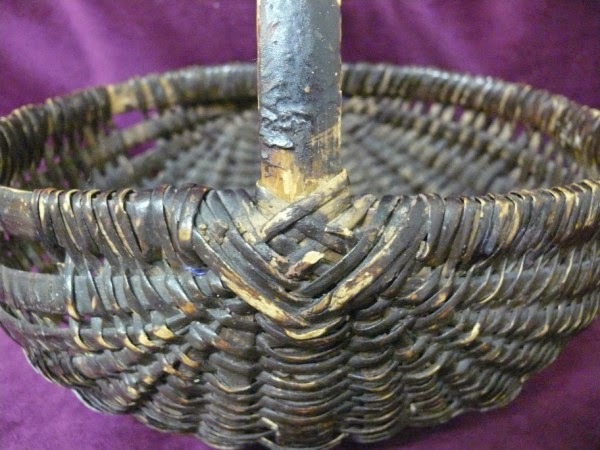 I concentrated on Mi'kmaq spruce root baskets and mill lunch baskets and traveled all over the west coast and central portions of the island to collect oral histories and photographs of this traditional craft. 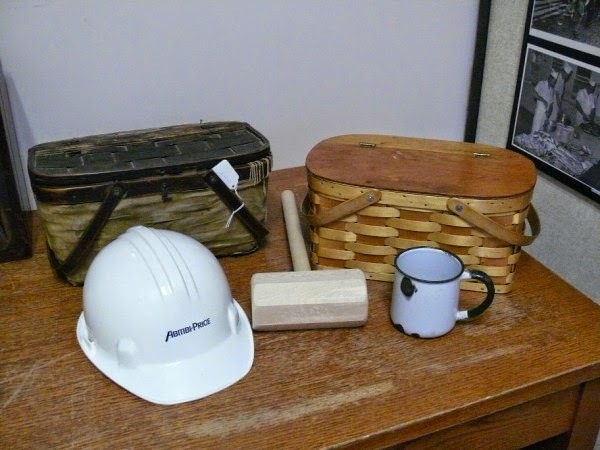 A hard hat, maul, mug and two mill lunch baskets. A woven melon shaped rib basket constructed from spruce root. owned by a nurse employed at the International Grenfell Association. Another project I helped develop was the pillow top workshop. I learned about pillow tops from my grandfather, who wove one as a pass time while working in the lumbercamps. I learned how to make the pillow tops and the frames and have been teaching workshops all over the island. The pillow tops have brought me to such places as Quidi Vidi, Cupids, Winterton, South East Bight and even the Logger's Life Museum bunkhouse in Grand Falls-Windsor. I continue to offer pillow top workshops, if you're interested in having one in your community, feel free to contact me at npenney4@gmail.com. 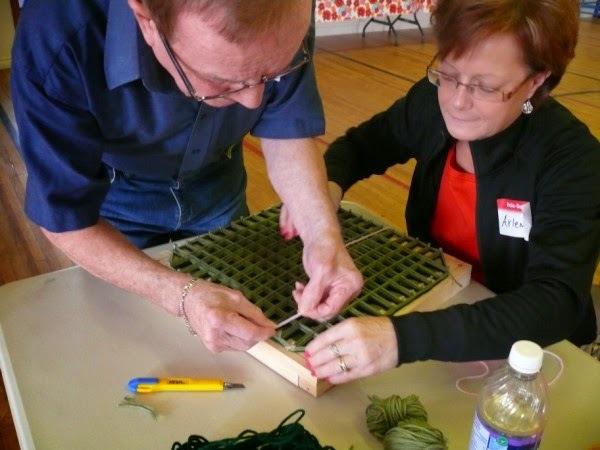 shows his daughter,Arlene Penney how to tie off the wool on the pillow top frame. Another project I really enjoyed working on was the Bay Roberts Telegraph Station exhibit. This exhibit was curated by my friend and colleague, Lisa Wilson, and was on display during the summer of 2013 at the Bay Roberts Road to Yesterday Museum. I was asked to photograph the artefacts, in order to compile an inventory of items to choose from for the exhibit. 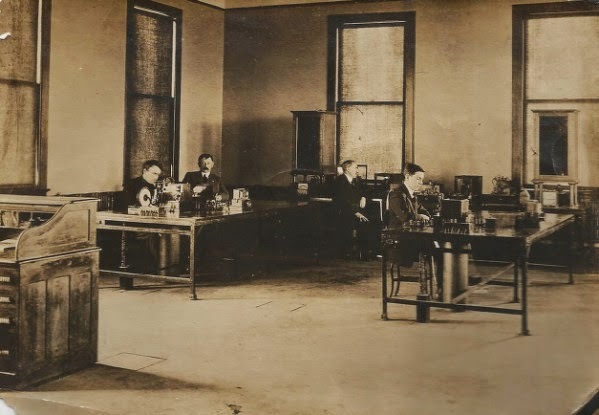 Telegraph workers in the Bay Roberts Western Union Cable Station. Another part of my job was arranging and describing materials for the Intangible Cultural Heritage Collection on Memorial University's Digital Archives Initiative. I love describing oral histories, you always learn something new and interesting. I digitized and wrote descriptions for countless collections such as Baccalieu Trail, Port Union and nursing. I also created several collections for the DAI, such as forestry, high steel, baskets and basket making, pillow tops, woodworking and skateboarding. My work with the DAI provided invaluable digitizing experience and I continue to offer digitizing services and convert such materials as photographs, tape cassettes, VHS, mini-disks and 8mm cartridges. I also offer photograph preservation and restoration, if you're interested in any of these services, please feel free to get in touch. I also led several workshops and was asked to speak with school groups. One of my favorite things about being a folklorist is talking with people. Recently, Dale and I ventured to Cupids to lead an afternoon sessions focused on digitizing and preserving old recipe books. Sharing stories at Nan's Cookbook: Tea and Talk. Sharing recipes at Nan's Cookbook: Tea and Talk. I had the opportunity to work on some great projects, with some amazing people and I'd like to thank all the heritage folks who have assisted, guided and mentored me through my time here. There are too many to name, but I'd like to thank Dale Jarvis for his guidance and for being a grant writing wizard and Lisa Wilson, for being a friend, mentor and confidant. Thank you to everyone who took the time to read my posts and have a look at the Tuesday Folklore Photo. Last, but certainly not least, I want to send my sincere gratitude to all the community members I've had the fortune of meeting, without you none of these projects would have been possible. So long and thanks for all the (blog) hits! personal message: Do you know of any photograph's of the interior of Nfld one-room schoolhouses? I am looking specifically for the type of pot belly stoves they used. Good Luck in your future endeavours Nicole! I've always enjoyed your blog updates and posts! You will surely be missed! In that first picture, who is the woman hanging on to the train? Who is the woman hanging on to the train?